Alfa Romeo is an Italian luxury automaker that technically started in 1910 however it was originally called Anonima Lombarda Fabbrica Automobili or A.L.F.A. for short. The first model produced for sale was a 24 horsepower vehicle in 1910. Over the next few years they were producing more powerful engines in the 40 to 60-hp. range and ventured into auto racing while earning a solid reputation for quality and design as you can also see in the Alfa Romeo car brochures and literature below. In 1915 Alfa Romeo came under the leadership of Nicola Romeo, but production was focused on military equipment for the war effort and railway equipment for the next several years. Automobile production came back to ALFA in 1919, which consisted of parts and automobiles that remained since 1915. In 1920 the name of ALFA was changed to Alfa Romeo and the vehicle of this new dawning for Alfa Romeo was the 1920 Torpedo. Alfa Romeo gained wide spread fame and recognition for their, vehicles, racing and engineering when Giuseppe Campari took first place at the Mugello race and Enzo Ferrari took second place at the Targa Florio race. Through the 1920s and early 1930s Alfa Romeo continued to produce top of the line vehicles that were ahead of their time where design and engineering was concerned. In 1928 Nicola Romeo left the company and in 1933 the Italian government rescued the company. Mussolini embraced the company under his government control and they continued to build the finest luxury cars for the wealthy and powerful while making an even bigger name in the world of auto racing. You will better understand after you take a look at the Alfa Romeo car brochures and literature below. During the Second World War the Alfa Romeo factory began producing engines for the military. When the war was over Alfa returned to producing automobiles, but the market had changed and there was demand for smaller less expensive vehicles. Although where racing was concerned Alfa Romeo was a major player and continues to do so to this day. Alfa Romeo started building smaller less expensive cars and the most popular long running vehicles were the Giulietta, Giulia and the Spider Duetto. The Spider stayed in production into the 1990s with very few changes over those years per the sales literature. When we look to the 1970s and 80s Alfa Romeo continued to produce vehicles for the wealthy, but their business in the United States was hurting for reasons involving poor quality and less than favorable reports of reliability. In 1986 Fiat took over Alfa Romeo yet there was little change where the U.S. market was concerned. They continued to build vehicles mainly for Europe, which consisted on some popular cars where the Alfa Romeo enthusiast was concerned. They were famous for their Spider, GTV and the top of line 164-luxury sedan. 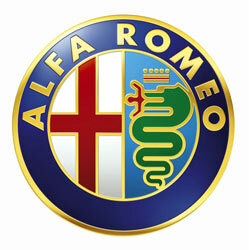 Finally in 1995 Alfa Romeo ceased producing vehicles for the American market. Sorry we don’t have a more extensive collection of Alfa Romeo car brochures and sales catalogs, but this an ongoing project. There have been many changes at Alfa Romeo over the years and then in 2008 they tried to get back in the US market with the Maserati V8 model 8C sports car, but sales were dismal at best. In fact they were so poor that they pulled out once again and reentered the US market in 2014 with the Alfa Romeo 4C. The 4C is a mid-engine sports car produces 240 hp. with a turbo powered four-cylinder engine. However the 2014 Alfa Romeo 4C is not intended for budget minded car consumer. At price tag somewhere in the $70,000 range for the least expensive model you can be sure that sales won’t be putting put them on the map. The Alfa Romeo never was built for the average Joe, but rather the car buyer with a much higher income than most of the population. Auto racing put Alfa Romeo on the map in the United States, but then it again they are just following the interesting history. Check out some of these Alfa Romeo car brochures and sales catalogs for a closer look. You read much more about Alfa Romeo here.